Previously, we shared the basic steps of applying Nail Lacquer. 1)	Protection and Promoting healthier nail. Most brands have added protein, aloe vera, vitamin E, calcium etc to their formula. All these featured ingredients add strength to the nail. And the base coat is a layer that separate lacquer from directly contacting the nail so the color won’t stain onto your nail, esp the dark colors. 2)	Easier application and Durability. Base coat fills the unseen lines / subtle creases in the nail so it provides a smoother, more receptive surface for the lacquer to adhere to and thus ensure the lacquer to last longer. 1)	General:This is the most common and popular type. It is thin, easy to control and quick drying. Suitable for healthy nails. 3)	Nail Strengthening:Depends on brand, it is a coating offering different ingredients such as vitamins, calcium, aloe vera etc which can repair/improve/replenish nails that are brittle/thin/dry, restoring the moisture that nails need in order to be healthy. Its texture is thin and easy to dry. It can either serve as base coat or use alone. Please go to Nail Envy for more details. 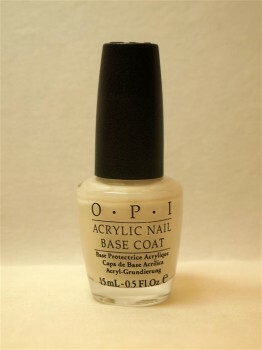 4)	Acrylic Nail Base Coat:It is a formula specially designed for Artificial-Nails. Originally named “Stain Resistant Base Coat”. It can help polish to be smoother and last longer. There is another trick from this base coat. Because of the thickness of it, painting acrylic nail base coat on the new nail from cuticle can fill the “gap” between the old polish and cuticle. Simply polish another layer of polish can gain you brand new flawless set of nail. For details please refer to another article about different types of Artificial nails. Same theory as in make-up, you can’t apply eye-liner, eye shadows, and blushes without make-up base or foundation! Not only it harms your skin, but the color won’t be adhesive and the make-up can’t stay long. So let’s make it perfect! Start using base coat to have a complete, perfect Nail Lacquer!